A flowchart is an excellent way of planning a project. Each stage of the project is set out as a sequence of events. 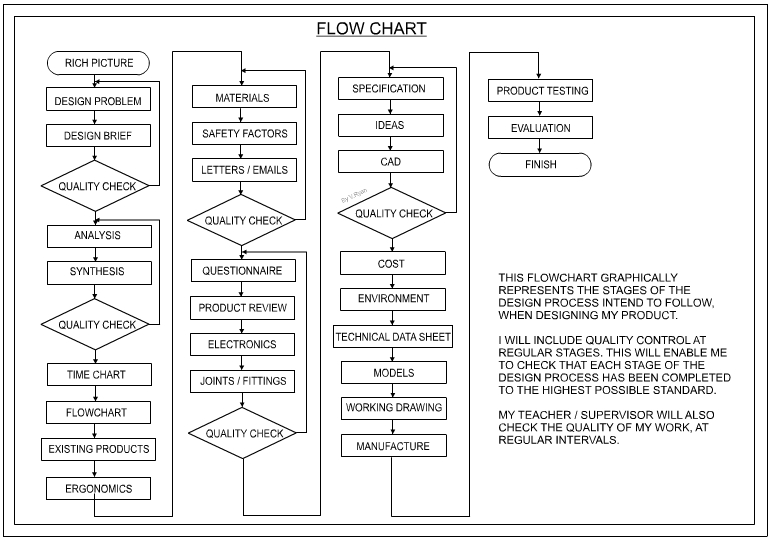 A typical standard flowchart is shown below. It shows the contents of a design folder set out as a number of individual stages. Each stage leads to the next, displaying the sequence of events. Unlike a time chart, there is no need to add time intervals for each stage, although this can be done if you are combining a flowchart and time chart. The example shown below is a basic example of a flowchart. 1. The first and last stage of the chart always have a box with curved ends (see example below). Rectangular boxes are used for most of the other boxes. 2. Every stage of the design / project is listed as a label within a flowchart box. If required, notes can be added alongside each box, explaining the work to be done at each stage. 3. BLOCK CAPITALS are used for the labels inside the boxes. 4. Colour and shade can be added. If this is done, it is recommended that the same colour is used for the rectangular boxes, and different colours are used for the other styles of boxes. 5. A diamond shaped box is used to display a quality check. A quality check can occur several times and at any stage in the design process. The example opposite only has one quality check, although normally there may be several. A quality check occurs when it is felt that a review of the project is needed. This may involve the teacher and pupil/student discussing the work and recommendations being made regarding improving aspects/design sheets. After a quality check it may be necessary for one or more sheets to be altered, amended or even replaced. 6. Use drawing equipment to help present the flowchart accurately. 7. Use a fine black pen for your printing / labels as this will make the text stand out, above any colour or added shade. 8. Add a bold title to the top of the page and describe how you intend to use the flowchart to help plan your project. A. Start by listing the sequence of stages on a piece of scrap paper. B. Use drawing equipment to draw the boxes adding text, printed between guidelines. C. Add limited notes to explain each stage / box. Only do this if you think further explanation is needed. D. Add simple shade / colour, with coloured pencils. E. Do not fall behind with your homework. You may not be able to catch up.